One of my big resolutions last year was to read more and read across genres. I met my yearly reading goal of 100 books, with 114 books read in 2013! Canaries, how did you do? 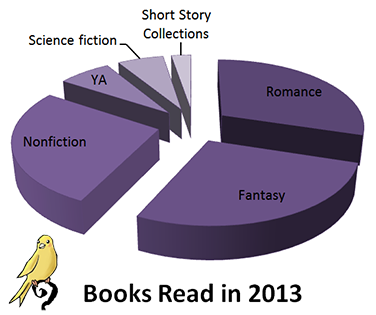 Though, if you break it down, about a third of the books in the romance category were paranormal or science fiction romance, and 22 out of the 31 Fantasy books I read in 2013 were Urban Fantasy. Still, I’m getting closer to my goal of variety reading. For 2014, my goal is to take this pie, and keep slicing it up. Let’s see if, by this time next year, I will have a few slivers of literary fiction and mystery in there, as well as beef up that science fiction slice. Brownie canary points to myself if I manage to slip in some international authors too! This entry was posted in Editorial, reading and tagged 2013, 2014, books, new year, reading, resolution. Bookmark the permalink. Yeah, not all books are made the same way! And they’re definitely not all the same length, heh. Half the time when I’m chomping on short novellas, I feel like I’m cheating at this whole reading thing. Goodreads also counts how many pages I’ve read, so that keeps me at least a little honest (over 40,000 this year). I need to get back into reading those large series. I miss them! My goal for 2013 was much the same and somewhere along the way, I lost track. This year, my goal is to keep track of the books I read and see just how many I do read. I used to lose track all the time, and then I discovered goodreads (man, that sounded like the opening to a bad infomercial). But seriously, I use Goodreads, mark the date I’m done with the book, and bam, it keeps track for me. Otherwise, all the books would have slipped through the cracks long ago. Have some reading goals, the bigger ones are to read more translations and in the original language (EN, PT, FR and SP). Ooo, translations! Didn’t think of that, but that’s a fantastic goal! I think I’m going to steal that. What better way to read international.